In City of Thieves, you are a hearty adventurer who wanders into the town of Silverton, which is beset by attacks from the villanous Zanzar Bone. 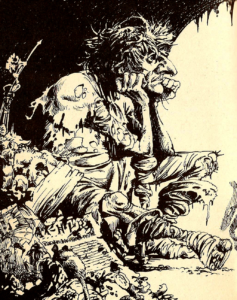 The foul monster wants to claim a young maiden for his own (I’ll resist the ‘bone’ comments), and when the village decided to resist, he has set his moon dogs to lay siege to the poor villagers, which is the typical reaction that you can expect from a man that doesn’t get his way with a woman. I don’t know what a moon dog is, but I imagine that their theme tune would be sung by a 1960s David Bowie. Oh Ziggy, come back – we miss you. In any case, before you know it, you’ve agreed to help out. It seems that the wise old sage Nicodemus knows exactly how to slay Zanzar Bone, so I’ll need to talk with him. 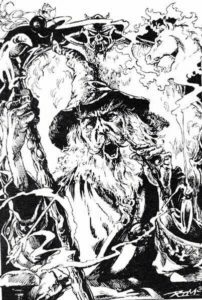 Unfortunately for all, Nicodemus lives in a wretched hive of scum and villainy, Port Blacksand – also known as the CITY OF THIEVES!! So it’s off on another wacky adventure. I was pretty lucky with City of Thieves today, because I rolled a 12 on my skill score. This luck seemed to filter through to most of the actual game-play as well. Still not enough to actually win the game, though! 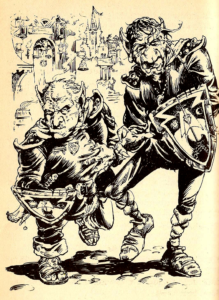 Deciding that it’d be a good idea to head to the market district, I took a path leading through some narrow alleys, and was attacked by two thieves. Killing them gave me some more gold. Strangely enough, I found that it was my gold that went up and down most in this adventure, rather than my stamina score! Killing thieves is a good source of income, it seems. 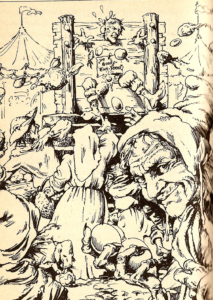 I was able to get to the market square without too much trouble, where I seen a group of people pelting rotten fruit at some poor sod who was locked in some stocks. Oh how lovely. I wonder what the poor chap had really done – probably refused to take part in Monty Python’s Life of Brian stoning scene. 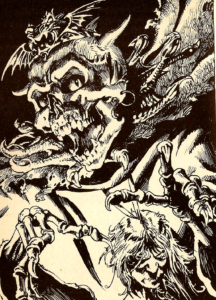 Stopping in at a local clairvoyant (who, in Fighting Fantasy books, are legitimately able to see the future, and not simply hucksters skilled in cold reading like they are in real-life), I was told that it’d be useful to look under the nearby bridge for Nicodemus. Sure enough, when I got to the bridge, there he was – a gruff old wizard who told me to bugger off because he didn’t want to help me – what we in the business call a ‘Gandalf goodbye’. Taking my leave of the useless old fool, I went for a jaunt down Candle Street. Entering the first house I came to (because in a city full of thieves, everybody leaves their doors unlocked – go figure! ), I met a man who made a deal with me – swallow one of his pills of unlabeled medication. If it doesn’t kill me, I win some gold. Did I mention that this book was made for kids? Needless to say – kids, if you are reading this, totally eat all of the random pills that strangers give you! No, seriously, this was just a madman who wanted me to swallow what could be poison – and I had no guarantee that they weren’t all poison. Either way, I got lucky and didn’t die. I pocketed 20 gold pieces and continued down the street, still utterly bewildered. Along the way, I was almost hit by a falling plant pot that had tumbled from a nearby window. Curious, I went into the building – again, totally unlocked, I guess the thieves stole the door locks. In this house, I seen two old ladies who were dressed up like babies, who were fighting over toys. Why does this kind of weird stuff always happen in these books to me? What god exactly have I displeased to such an extent that infant grannies is the punishment that I’m forced to endure? And why do I have a creepy feeling that there’s several websites online that’re probably dedicated entirely to this sort of thing…. Anyway, they wanted a toy from me. Not feeling especially in the mood to cater to this kind of insanity, I gave them the iron spike that I’d bought from the market to play with. Further along Candle Street, I found a group of little gnome-like creatures playing a game much like baseball. Given my high skill score, I decided to join in, hoping I’d get something useful. Sure enough, I hit a home run and was rewarded with; some gold coins, a potion, a little flute, some bananas, a stick of chalk and an eye patch. So in general, the contents of the city’s gutters. Pah. What, was an empty tin can too good a prize to give away? Without even bothering to note this rubbish in my inventory, I left the playing field in disgust. 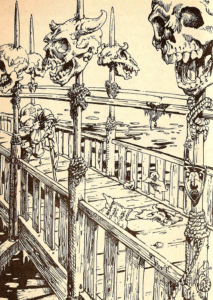 By this point in my travels, I was was of the firm opinion that Candle Street is the Arkham Asylum of Port Blacksand, so I promised never to go back there again and instead walked in the opposite direction as fast as I could.Eventually I stumbled across the harbor of this port town, in which was moored a pirate ship. I figured that this would be a good place to look for items, and so I carefully slipped on board. Several of the pirates were asleep, and so I carefully pick-pocketed them. Sadly, my luck wasn’t up to the challenge, and three of the pirates attacked me. I killed the lot, and found my first important item in the pirate’s pockets – six black pearls. Huh, are black pearls actually a thing? Curious as to what might happen if I explore the rest of the ship, I slip into what I thought might have been the captain’s cabin only to find that someone had poured themselves a nice hot bath tub full of water. The book gave me the option to hide around in here, for some reason. I did so, and soon enough a large naked man entered the room and got into the bath. I was then given the option to say ‘ahem’ to him loudly… I have no idea why I’d want to, but I decided to take the gamble and see what would happen if I did so. It seems this was the option to interrogate the man – he told me where I could get a silver arrow, from a local silversmith. Y’know, I may have been able to work that out on my own, it’s one of those obvious kind of things.In return, I helpfully inform him that his bath water is wet. On the way to the silversmith, though, I tried to help an injured boy who was lying sobbing in the road. Because I’m a good person. And of course, the injured boy was in fact a goblin thief who attacked me. My lack of surprise is… well I chopped him in two with my sword (just to be sure to teach the kid a lesson), and took his gold, some garlic, and some knuckle bones he happened to be carrying for some reason. The gold was immediately useful, as I came across a candle-maker’s shop. I bought two scented candles, just in case they may be useful. “Would you like to see a magic candle?” said the shopkeeper. I agreed. The shopkeeper then used a magic candle to hypnotize me, and proceeded to steal two items from my backpack. I decided that he could steal my bananas and eye patch. I’m sure they will serve him far better than they did me. I still had enough gold left over to buy a silver arrow in the silversmith’s shop though – my second important quest item! And it was so easy to obtain, I didn’t need to kill any trolls or solve any puzzles, I just had to ask for it. Well, I suppose I had to encounter the naked pirate earlier… some mental images you just don’t want to live with. As I continued searching the streets, I was confronted by an escaped convict, who begged me to help him flee the city guards. He claimed that he had been robbed, and as such he was unable to pay his taxes. I would have probably helped him, but if the guards were to catch me I didn’t have any papers to show that I had a right to be in this city. So I handed him over to the guards instead. Curiously, the guard told me the truth – that the man was an escaped MURDERER. For once, betraying a man in need of help was the right thing to do. Is it surprising that Port Blacksand has a city garden? It surprised me. From everything that I’d seen before, I imagined that the city garden would consist entirely of different kinds of mud, possibly with thieves hiding under it. After all, the city does thus far seem to have about as much sanity as a Facebook comments section. I slip over the walls of the garden, expecting to find it full of, oh I don’t know, living topiary monsters or something. But no, it actually did have flowers. Real flowers. Including a lotus – my third item! I grabbed it, quite aware that the topiary animals would then immediately attack me. To my utter shock and surprise, they didn’t… okay, kidding, they completely did. Because of course they did. The topiary animal monsters actually did a bit of damage, so much so that I had to use one of my meals in order to recover some stamina. I had only two things left to do – get into the sewers so that I could kill a hag and take some of its hair, and get a stupid tattoo on my face. Before I could do so, though, two of the city guards bumped into me in the middle of the street. They were orcs if I remember right, called Sourbelly and Fatnose (I wonder if that’s Corporal Sourbelly, or Lieutenant, or maybe even Captain?) and were cruel and malicious bullies who terrorized the citizens of Port Blacksand. But to be fair, they probably think they’re just being gentlemen. They tried to threaten me, but when they asked to see my ID, I had to tell them I didn’t have any. I explained it to them very carefully and politely. With my sword. Unfortunately, killing two of the guards wound up attracting all sorts of attention. Thankfully, one of the townspeople lead me to his cart, where he smuggled me out of the city beneath a bale of hay. By now, the city was in an uproar, and probably under martial law to boot. There was no way I could get back inside in order to get the hag’s hair, or to get that stupid tattoo. Now that I think about it, I think I see some disturbing undercurrents to Port Blacksand. As weave seen, the police are corrupt, violent crime lurks in the back streets, the masses are ready to turn to vigilantism, prisoners routinely escape from the prisons, many people are clearly criminally insane… At this moment, I thought of forgetting my mission, leaving the salvation of Silverton to another wandering hero. But no, the city of Port Blacksand needed me. They needed a hero. They needed someone to strike fear into the superstitious hearts of the criminals. I would prowl the night. Blacksand would be my city now. I would be a hero – not the hero that Port Blacksand deserved, but the hero it needs. I would be that hero. So no, my adventure has not been a total waste. Not at all. Not while the Port is protected by the shadow… of BATMAN! 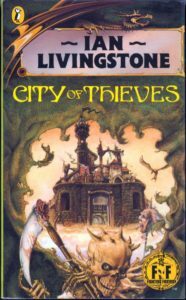 I still very much enjoy City of Thieves. This was the first Fighting Fantasyy gamebook set inside an urban environment, and it came off very well. In terms of writing, all they really had to do was change the tunnels to streets and rooms to shops, but in doing so the city comes off as feeling very vibrant and alive. There feels like there’s a lot going on at all times, and it’s still one of my favorite of the series. Cause of death: Retirement to pursue a life of crime-fighting.